In Rome the custom is that on the first day of snow, the "Prima nix", students are given the day off from lectures. Sadly for the students at Wonersh, this custom is not observed in England. 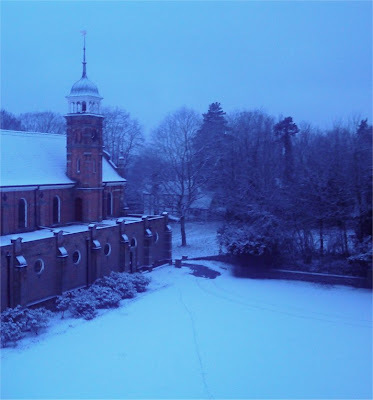 Above is the view from the window of my room at the Seminary after breakfast this morning. Fortunately, the afternoon was a little brighter and I was able to drive round the M25 and in to North Greenwich in time to catch the tube to the Good Counsel Network where I was giving Benediction. Then a peaceful and quiet evening Low Mass in the parish before catching up on the blogosphere.